Operate is the platform that powers today’s flexible workspace industry; being specifically created for companies providing long term office rentals, coworking space and meeting rooms, as well as related products and ervices. Operate provides a comprehensive environment, as well as the tools that help your teams operate efficiently, find new tenants and help you retain members longer. Maximize your revenue per member, with the Self-Service Online Catalog, which allows you to make all your services available online for your members to consume. Monthly allowance upgrade plans, credits and complex discounted hours are easy to promote. 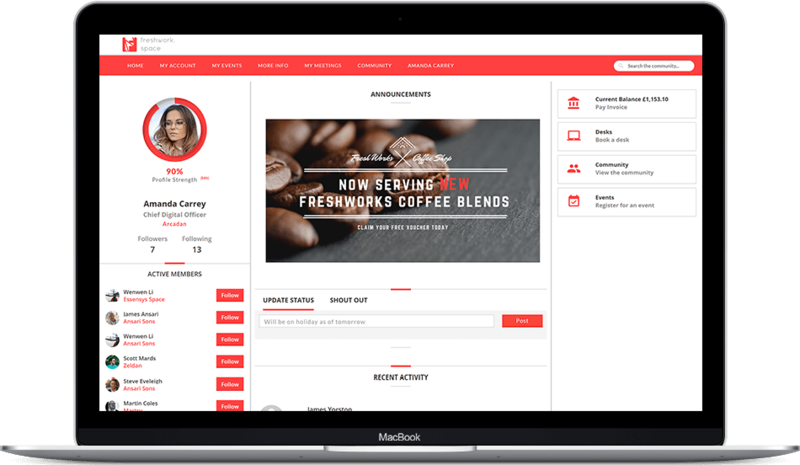 The On-Demand Marketplace lets you accommodate the need for desk or event space in real-time by creating and promoting limited-time discount rates and plans. 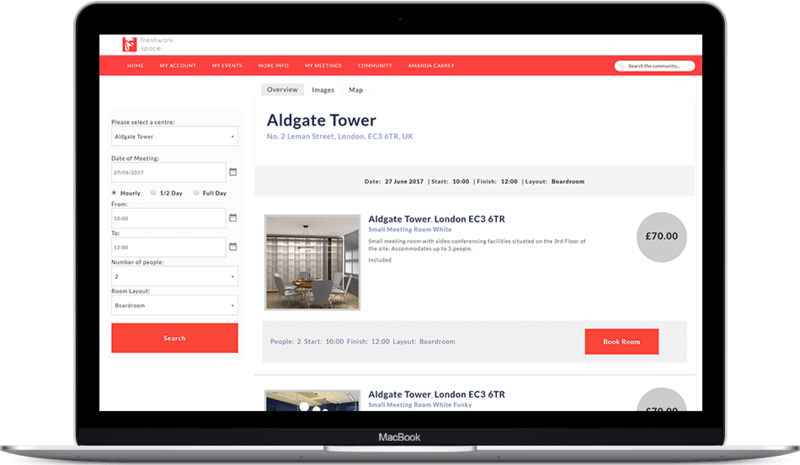 Increase occupancy levels - List, promote and sell empty or vacant space through your own private community, 3rd party websites or directories. Recurring bookings are made easy with online widgets. Better integration and user experience - Operate integrates with numerous other platforms, via Zapier, which is a cloud based marketplace that allows you to connect other apps with the essensys platform. It can help you enhance your internal and member user experience. Make fast informed decisions - Get a unified view of your workspace including occupancy rates, utilisation levels, revenue, churn and debtors. Drill down to customer level detail to uncover opportunities. Forecast Workspace growth - Improve growth forecast accuracy using a budget planner and KPIs – including revenue/ sq.ft./ available room/ service; occupancy rates. 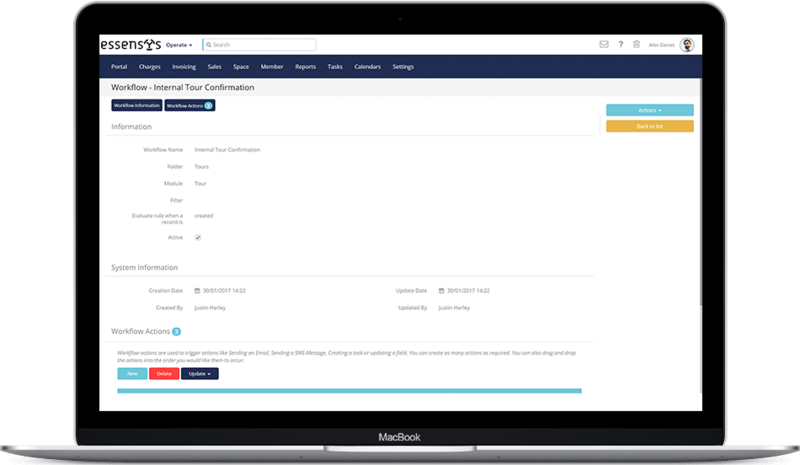 See workspace performance across sites - Customise your Operate reporting to show key KPIs across sites, spot the best performers and coordinate your teams to replicate success. View your revenue streams at a glance - Stay in control of your balance sheet and P&L with a real-time view of revenue against unbilled charges, credit notes or unpaid invoices. View customer balances and renewals - Report in real-time on contract or license renewal dates, check balances against the most recent point of sale transactions and act. Be the most customer centric operator out there - Offer everything from on-demand space and services to day rates and short or long term contracts. Without any operational overhead or revenue leakage. Faster license activation with eSign - You and your members get an easy, secure way to sign licences electronically - making them legally binding. Licences signed by all parties are automatically stored against your customer's account. You have access to unlimited license templates and an easy way to include counter-signers. Your whole team can access eSign without any extra cost, while benefiting from a solid audit tail. More licence flexibility - Create license templates based on specific tenant needs - fixed, rolling or fixed then rolling terms. Manage them with ease alongside standard terms, keeping members happy. Easy Inventory Management- Create and manage a service catalogue for space and on-demand services, develop a large variety of membership plans, discounts and promo rates without hassle. Convert inventory to cash - You can see occupancy and utilization levels for your site any time. Combine it with reports on services consumed and you get a clear view of new opportunities. Your members can pay for services and renew contracts online. Keep Closing Business with the Point of sale, that helps you lose opportunities on both space and on-demand or ancillary services as they arise – custom pricing and discounts are easy to create and apply at member level. You always have a 360-degree view of your tenants and members. You know what they buy, expect and afford and can tailor renewal contacts to fit changing needs. Be smart about your tasks, activities and processes - You can ensure all your teams pull in the same direction by automating triggers and actions across customer lifecycle stages handled by different parts of your business. Multichannel lead feed - Leads you get from your website, social media or brokers enter your system automatically. They’re assigned to sales reps and get greeted with a personalised email intro. Enhanced tour experience - Tour confirmation is done automatically via email or SMS, with prospects and your sales rep. Follow-up emails and sales actions kick in to help with conversion. Single set up, global use - Once an opportunity is won, account creation and services allocation takes a few clicks. Notifications are sent to your centre manager, operations and finance teams to take over. Invoice and payment collection - You can produce invoices, direct debit or standing order details automatically. Send a copy to the customer and another to your finance team to ensure smooth follow-up. In-life management - Automate welcome emails, greet your members by name, ensure all meeting rooms, desks, office or event space is ready and IT and comms set up correctly. Make staying easy - You can define renewal prompts for your centre manager, operations and sales teams. Give your teams enough time to define, negotiate and sell the next retention deal. Create a community around your business - All your tenants and members are automatically added to your own private community where they can interact with you, peers and self-service. Integrate - You can securely pass information and data between your apps and the essensys platform using Zapier. With no coding skills required, you can integrate, automate and innovate. Unleash the full value of a great customer experience! - Direct access to your members means you can provide a more personalise experience. It’s easy to transition customers to brand advocates and active referrers. You help them build a strong network and uncover business opportunities, whilst you create new revenue streams. Seamless Self-Service Experience - Make it easy for your tenants and members to consume services by enabling them to reserve desks, book meeting rooms, buy ancillary services – postage, printing, etc. – online. Make statements, invoices and licenses visible and allow customers to settle balances online. Make It Your Own - You can white-label the community portal so that it aligns fully with your brand identity, from look and feel to the tone of voice, as part of your posts and announcement entries. You have full control over the modules and information that you make available. Create and Communicate Value - Enable your customers to interact with you and each other through online messages or calls. Use events and briefings to create a friendly environment for networking and doing business together. Have your workspace perceived as an all-size business incubator. Drive New Business Streams - Get access to all individual members in your sites. Increase your revenue exponentially by diversifying your portfolio in line with member demand trends. You can run polls and focus groups, ensuring you introduce star services and 3rd party perks. Never miss a last-minute sale, cross or up-sell opportunity - Your front-desk staff can create accounts and add services on the fly. Enhanced Workspace Experience - Creating a new account and adding space, Wi-Fi, Voice, membership plans for hot or dedicated desks only takes a few clicks. The same goes for adding services to existing accounts – catering, additional meeting room hours, or delegate rates. Flexible Pricing - If you run a discount policy for large opportunities, you can amend the price of specific services at point of sale. This will not affect the standard price or any future transactions. You can keep your customers happy. No Risk of Revenue Leakage - Once you complete an order at point of sale, a charge sheet is generated against the customer account or individual member. It’s then transferred automatically onto the next invoice you produce. Operate your workspace efficiently - Manage all your plan, order, payment and renewal related tasks from a single interface and never worry about billing reconciliation. 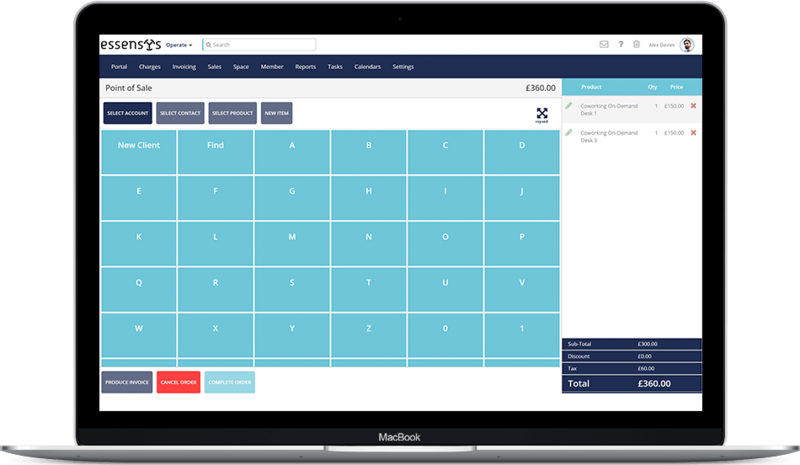 Maximise revenue per member - Create license agreements, membership types, different service and delegate rates and assign them to members as needed with a few clicks. Use Multiple Currencies - Make it easy for your customers to order and pay for services online in multiple currencies depending on your workspace locations. Flexible billing - Create invoices, access charge sheets or add one-off ad-hoc charges and discounts against accounts seamlessly. Export invoices to your preferred financial system with ease. Import external charges - Import call or postage charges from third party software to eliminate the need to use multiple systems for billing and reporting. 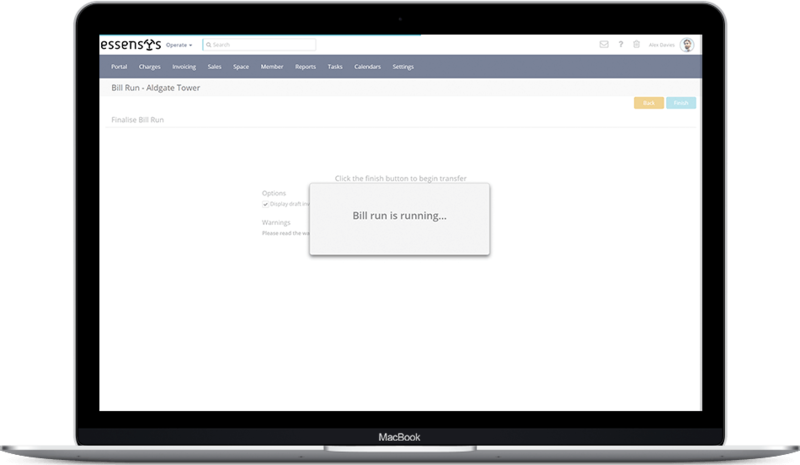 Bill Runs - Generate automatic invoices, by simply selecting what you would like them to include. You can process invoices for one customer or your entire list of customers across sites. Flexible payments and collection - Set up direct debit payment options and import opening balances from existing sources. Or use credit card, BACS transfer, ACH and payment gateway integration options. Members with admin accounts can view and make payments against their balances through the member portal. Billing reconciliation is made easy. You can also set up custom reports on aged debtors or late payments and apply charges as needed. It’s easy to keep track of your revenue. Operate allows you to control everything from one simple, yet sophisticated, cloud based application. Operate is a modular software that provides all of the tools you need, in order to manage every aspect of your business. Each module is based on the different areas that you might need to coordinate - they are separate, but interdependent at the same time. Below is a list of available modules; along with an explanation on how each of them may help you. Charges- Here is where you can keep track of and manage your cash flow - create, view and manage charge records or import charges from other sources..
Calendar - Your Calendar module allows you to easily view and manage bookings across all of your locations. Invoicing - This is the module that makes it easy for your to create, view and manage invoices and credit notes, as well as go through monthly bill run processes and bill all of your customers in one go. This is where you can also integrate Operate with external invoicing/financial applications. 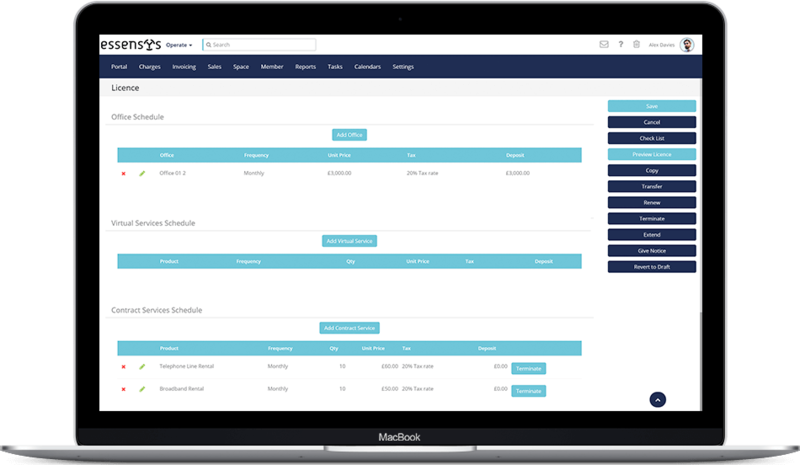 Member - This is your very own, seamlessly integrated CRM module, that allows you to manage client accounts, contacts, licences and more. Portal - Here is where you can manage your member portal - a place where your customers can come and form a community, as well as make payments or book space. Reports - This module provides insight into your business. There are default reports already available, but you can also add your own any time, using every piece of data within your Operate. 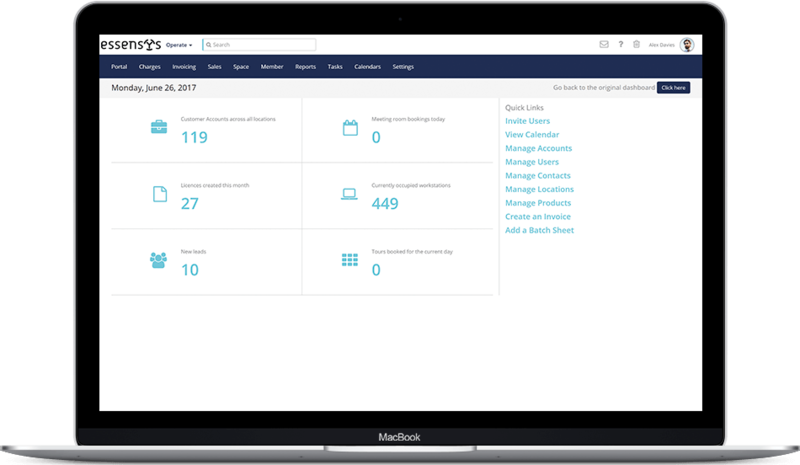 Sales - Easily gain insight into and manage your sales, from a single module that provides a comprehensive dashboard, as well as information on leads, opportunities and tours. Integrate Operate with leadDADI to advertise your workspace with brokers. Settings - This is where you can make Operate your own, by configuring different aspects of the application, setting up your community and creating time-saving workflows. Space - The Space module includes all of the products and services your business is providing to customers. as well as your locations. From biscuits to office space, it’s all in here. Tasks - The Tasks module allows you and your staff to easily keep track of what needs to be done. It stores your tasks and makes it possible for everyone to be notified on their to do-s.
Watch a video about how to navigate Operate! Read an explanatory guide to Operate's main menu!